Bus from Penang to One Utama (Damansara) is a unique bus route connecting Penang and Damansara area in Kuala Lumpur. 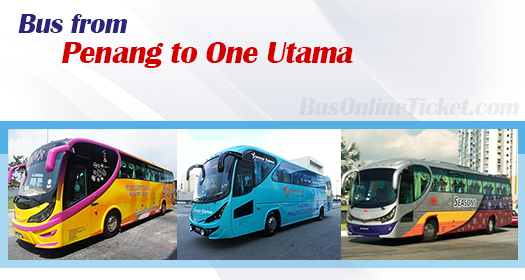 With the rising population in Damansara area Kuala Lumpur, there is growing demand for direct bus service from Penang to One Utama. There are plenty of choices for bus from Penang to Kuala Lumpur. Usually the arrival point is at Pudu Sentral Kuala Lumpur city centre, which is about 30 minutes to 1 hour driving distance from Damansara area, depending on traffic condition. Because of the convenience by taking bus from Penang to One Utama, especially for residents staying in Damansara area and visitors going to Damansara, the bus service is always in demand. Advance booking is highly recommended for bus from Penang to One Utama to avoid disappointment. The bus fare for bus from Penang to One Utama is around RM 41.00, except the festive period of Chinese New Year and Hari Raya Haji. Duration for bus from Penang to One Utama usually takes about 4 hours, depending on traffic condition. By comparing to taking bus from Penang to Kuala Lumpur and arriving at Pudu Sentral, passengers could save the time and hassle of travelling time between Pudu sentral and Damansara. Usually there is a washroom break provided along the highway. Season Express (deploying Fivestar Express for this bus route) and BillionStar are the only two bus operators providing the bus from Penang to One Utama. Lastly, taking bus from Penang to One Utama is convenient especially for residents staying in Damansara area. Now it is even more convenient by booking bus ticket online at BusOnlineTicket.com with instant confirmation. Because of the growing demand for this bus service, do book your ticket online in advance to avoid disappointment.